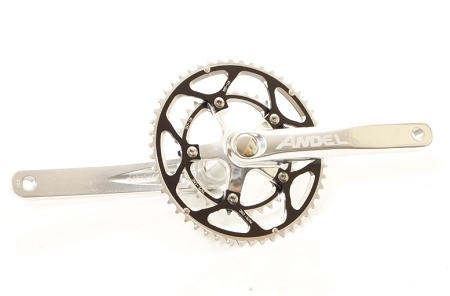 Andel 130bcd standard double crankset. These cranks use the Shimano hollowtech system with 24mm spindle. So any bottom bracket for a Shimano style 24mm system will work. Bottom bracket is a 24mm external bearing bottom bracket. Bottom brackets available to fit most modern bike brands including Trek, Cannondale, BB30, PF30, and more. Click here to see bottom bracket options. 1. weight 1200 grams with chainrings and bottom bracket (50/34T length 200mm).